The aircraft was en route from Moscow to Hong Kong at 10100 m when, approaching the Novokuznetsk reporting point, the captain's daughter entered the cockpit. She was allowed to sit the left-hand seat while the captain demonstrated some autopilot features, using HDG/S and NAV submodes to alter the heading. The captain's son then took the left front seat. The captain intended to demonstrate the same manoeuvre when his son asked if he could turn the control wheel. He then turned the wheel slightly (applying a force of between 8-10 kg) and held it in that position for a few seconds before returning the wheel to the neutral position. The captain then demonstrated the same features as he did to his daughter and ended by using the NAV submode to bring the aircraft back on course. As the autopilot attempted to level the aircraft at its programmed heading, it came in conflict with the inputs from the control wheel which was blocked in a neutral position. Forces on the control wheel increased to 12-13 kg until the torque limiter activated by disconnecting the autopilot servo from the aileron control linkage. The autopilot remained engaged however. The aircraft then started to bank to the right at 2,5deg/sec, reaching 45deg. when the autopilot wasn't able to maintain altitude. The A310 started buffeting, which caught the attention of the captain who told the co-pilot to take control while he was trying to regain his seat. The seat of the co-pilot was fully aft, so it took him an additional 2-3 seconds to get to the control wheel. The bank continued to 90 degrees, the aircraft pitched up steeply with +4,8g accelerations, stalled and entered a spin. Two minutes and six seconds later the aircraft struck the ground. 1. The decision by the PIC to allow an unqualified and unauthorized outsider (his son) to occupy his duty station and intervene in the flying of the aeroplane. 2. The execution of demonstration manoeuvres that were not anticipated in the flight plan or flight situation, with the PIC operating the autopilot while not at his duty station. 3. 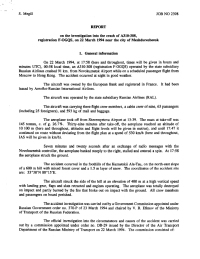 Application by the outsider and the co-pilot of control forces that interfered with the functioning of the roll channel of the autopilot (and are not recommended in the A310 flight manual), thus overriding the autopilot and disconnecting it from the aileron control linkage. - The A310 instrumentation has no declutch warning. The provision of signals in accordance with the requirements of Airworthiness Standard NLGS-3, para. 8.2.7.3., and international recommended practices, could have enabled the crew to detect the disengaged autopilot in a timely manner. - The PIC was away from his position and distracted by the conversation with his daughter. 5. A slight, unintentional further turn of the control wheel(s) following disengagement of the autopilot caused a right roll to develop. 6. The PIC and co-pilot failed to detect the excessive right bank angle, which exceeded operating limits, and were late in re-entering the aircraft control loop because their attention was focussed on determining why the aircraft had banked to the right, a manoeuvre they interpreted as entry into a holding area with either no course line or with a new (false) course line generated on the navigational display. A strong signal indicating that the aeroplane had exceeded the allowable operating bank angle, taking account of the delay in recognizing and assessing the situation and making a decision, could in this situation have attracted the crew's attention and enabled them to detect the bank at an earlier stage. 7. The aeroplane was subjected to buffeting and high angles of attack because the autopilot continued to perform its height-keeping function even after the actuator declutched and as the right roll developed, until the pilot disconnected it by overriding its longitudinal channel. - temporary loss of spatial orientation in night conditions. In order to improve state oversight of flight safety, proposals should be prepared and submitted to the Government of the Russian Federation concerning the strengthening of state inspection units and the inclusion of highly qualified specialists within them. The necessary steps should be taken to increase cockpit discipline in flight and to organize effective monitoring of compliance with flight procedures, using airborne voice and data recorders. Flight crew training should be improved to take account of the special factors revealed by the investigation of this accident, including the monitoring of aircraft attitude during instrument flight and methods of recovering from unusual attitudes. Review the question of creating, within the Russian civil aviation system, single-type operations centres for aircraft of foreign manufacture. Together with the aircraft designers and in cooperation with specialists from the research organizations of the Russian Federation, determine the measures necessary to prevent aeroplanes from exceeding their operating bank and angle of attack limits and to prevent the autopilot from disengaging its aileron control function without warning. Make a number of amendments and additions to the A310 flight manual and other regulatory documents in response to the material in the Report and the shortcomings revealed during the accident investigation. Distance from Moskva-Sheremetyevo Airport to Hong Kong-Kai Tak International Airport as the crow flies is 7099 km (4437 miles).